Those of you who have been following me for a long time know that PDP is not the only City Daily Photo blog in the world, we are a legion! And every 1st of the month, we have a tradition: called a "theme day" which consists of posting a theme photo. Lately the City Daily Photo portal was down so it was hard to see all theme photos at once, but for about 2 weeks, thanks to the very hard work of Peter and Julie, we have a brand new one! So here you go, do visit CityDailyPhoto.org, or go directly to the theme day page and see for yourself. BTW, the theme today is Water's Edge, I first thought of the Seine of course, but I've done that a lot... So I went to Place de la Concorde, put my camera as close as I could to the edge of one of the Jacques-Ignace Hittorff 's stunning fountains and took this shot. 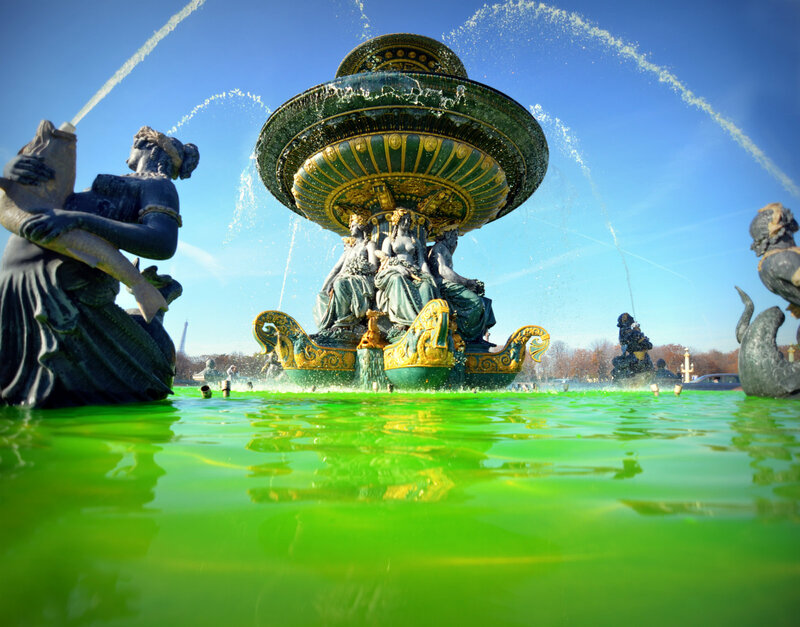 The colors are natural, there was a superb blue sky in Paris yesterday and they put this green stuff in the water, probably to boost the contrasts. I love it. Fab golden reflections on the green, green water and oh la! that gorgeous blue Paris sky! Wish I was there. I'm glad you explained you had just taken the shot yesterday. I thought it looked rather summery. I'm not sure how I feel about the green water, but it makes for a super colorful and unique shot of the fountain. Nice take on the theme! Thank you once again, Eric. For the picture and for taking the time to talk about the portal coming back. I'll add on my thanks to all the others who made it possible! PDP may not be the only City Daily Photo blog, but it was the first—and look what you started! I love your interpretation of "water's edge," and I'm glad to be able to go see some more on the brand new portal. Usually when one sees water like that, it means "Ewwww, algae!" But I'm glad this is not the case here. Lovely, lovely blue sky....forgotten what those look like in our gray, gray, gray weeks. 1. Thanks for starting this daily photo idea. We all await it each evening here in the states. 2. You devil! You included the Eiffel tower into the shot! What a stunning image. The colours, the light! Superbe, Eric. I had no luck with the Linky thing but have written Julie. @PHX "What fun! The colors, the movement ,the history ..I 'm lovin' it" ;-)) BTW where are you now? NYC. @PerthDailyPhoto "that gorgeous blue Paris sky! Wish I was there." Gimme a break, you're much better off in Perth, where it's warm and... where you have black swans! @Kim "I'm glad you explained you had just taken the shot yesterday. I thought it looked rather summery" Yes, true, it does look like summer, but the temperature was not summary AT ALL! @Shantaram ". I'll add on my thanks to all the others who made it possible!" Yes, they deserve it. @Alexa " I'm glad to be able to go see some more on the brand new portal." Yes, me too! @Christie ". Lovely, lovely blue sky....forgotten what those look like in our gray, gray, gray weeks." I know! @babzy "très beau cadrage :)" Merci ;-) elle aurait peut-être mérité d'être un peu plus large, mais je n'aurais pas eu l'effet d'affleurement de l'eau. Et pourtant j'ai un super grand angle ! @Steverino "You're welcome ;-) "2. You devil! You included the Eiffel tower into the shot!" LOL. Did not do it on purpose! @Jilly. "Eric. I had no luck with the Linky thing but have written Julie" I'll be honest I got it wrong too, but now I got it and I'll be ready for next time. Are you now? I love it too - it's a great picture! Love how you picked up all of the colors on the fountain's centerpiece. I love the colors in the shot. Nicely done! Do French ppl celebrate first November? Yes, but for us it's La Toussaint, the day we remember the dead. Looks like a fountain full of lime cordial....great shot! Looks like a bucket of sirop de menthe has been thrown in. Simply add pastis for the world's largest Perroquet. Eric, you've outdone yourself today. This photo is Spectacular!!! LUV the blue and greens. Merci, merci for sharing such beauty! Love the amazing color contrasts for theme day! Thank you for continuing to 'shepherd' us through theme day and all CDP adventures! I um am still in CDG for the 4 th day but leaving tomorrow. @Drummond "the world's largest Perroquet." I see... you're a connoisseur ! @LondonLuLu. "Thank you for continuing to 'shepherd' us through theme day and all CDP adventures!" You're very welcome and congrats on our sunset! I love this!! Such beautiful colors. Thanks for Daily Photo. It's become such a fun part of my life. Love your choice for the theme day. Thank you for sharing it with us all. You are not the only one, but if I am not mistaken, you were the very first. You inspired all the rest! And thank you for that! Superb fountain and the tonalities of the composition are magnificent with the Tour in the background! Thanks Eric for visiting and yes the parachute was real. @Carraol. Yes, in fact I realized after I posted my comment that it was NOT a kite, but a parachute. Still the effect was really breathtaking! I love all the colors in this picture, too. Lots of contrast and great angle. There is nothing better than a blue sky! What fabulous symmetry and wonderful colours! Sadly, if we had water that colour downunder, it'd be due to a toxic algae bloom! !